In its thirty fifth flight (PSLV-C33), ISRO’s Polar Satellite Launch Vehicle successfully launched the 1425 kg IRNSS-1G, the seventh satellite in the Indian Regional Navigation Satellite System (IRNSS) Thursday afternoon (April 28, 2016) from Satish Dhawan Space Centre SHAR, Sriharikota. This is the thirty fourth consecutively successful mission of PSLV and the thirteenth in its ‘XL’ configuration. IRNSS is an independent regional navigation satellite system designed to provide position information in the Indian region and 1500 km around the Indian mainland. IRNSS provides two types of services. These are Standard Positioning Services (SPS) – provided to all users and Restricted Services (RS) – provided to authorised users. Prime Minister of India Narendra Modi, thanked and congratulated all the ISRO scientists and team ISRO for completing IRNSS constellation and dedicated IRNSS to the nation as ‘NavIC’ (Navigation Indian Constellation). He appreciated India’s space community for making the country proud through such achievements which have helped in improving the life of common man. After PSLV-C33 lift-off at 1250 hrs (12:50 pm) IST from the First Launch Pad with the ignition of the first stage, the subsequent important flight events, namely, strap-on ignitions and separations, first stage separation, second stage ignition, heat-shield separation, second stage separation, third stage ignition and separation, fourth stage ignition and satellite injection, took place as planned. 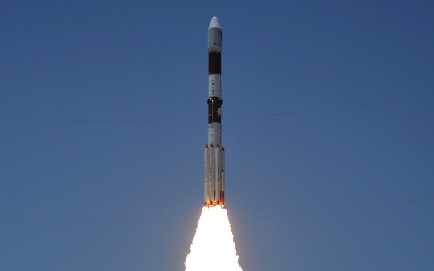 After a flight of 19 minutes 42 seconds, IRNSS-1G was injected into an elliptical orbit of 283 km X 20,718 km inclined at an angle of 17.867 degree to the equator (very close to the intended orbit) following which the satellite successfully separated from the PSLV fourth stage. After separation, the solar panels of IRNSS-1G were deployed automatically. ISRO’s Master Control Facility (MCF) at Hassan, Karnataka took over the control of the satellite. In the coming days, four orbit manoeuvres will be conducted from MCF to position the satellite in the Geostationary Orbit at 129.5 deg East longitude. IRNSS-1G is the seventh of the seven satellites constituting the space segment of the Indian Regional Navigation Satellite System. IRNSS-1A, 1B, 1C, ID, IE and 1F, the first six satellites of the constellation, were successfully launched by PSLV on July 02, 2013, April 04, 2014, October 16, 2014, March 28, 2015, January 20, 2016 and March 10, 2016 respectively. All the six satellites are functioning satisfactorily from their designated orbital positions. A number of ground facilities responsible for satellite ranging and monitoring, generation and transmission of navigation parameters, etc., have been established in eighteen locations across the country. Today’s successful launch of IRNSS-1G, the seventh and final member of IRNSS constellation, signifies the completion of the IRNSS constellation.